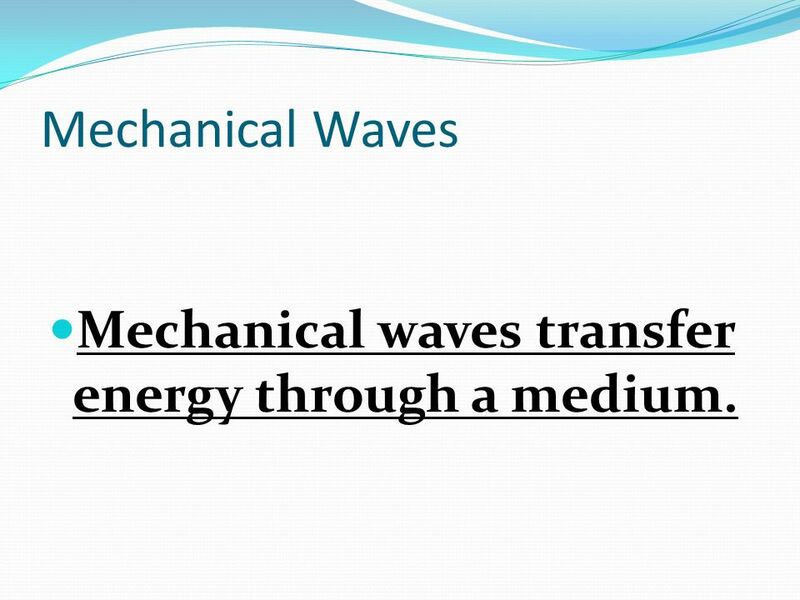 5 Mechanical Waves Mechanical waves transfer energy through a medium. 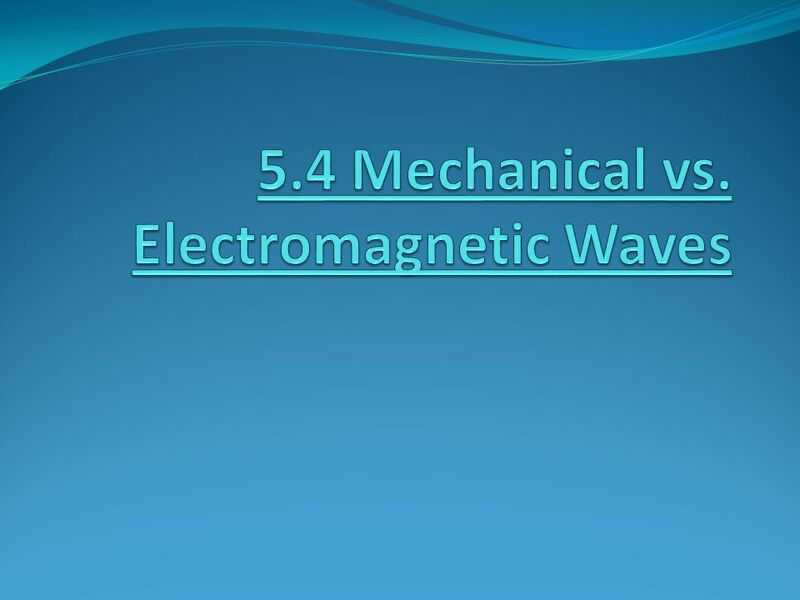 Electromagnetic waves do not use a medium to transfer energy. 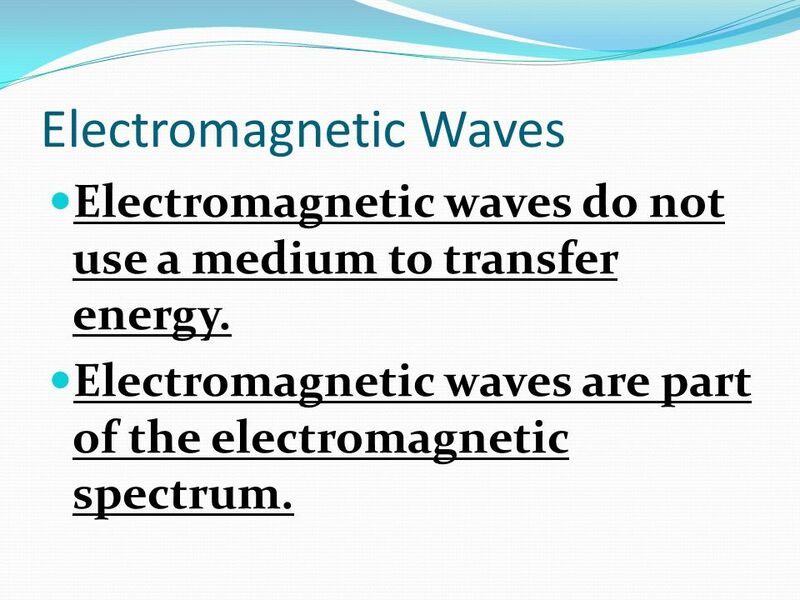 Electromagnetic waves are part of the electromagnetic spectrum. 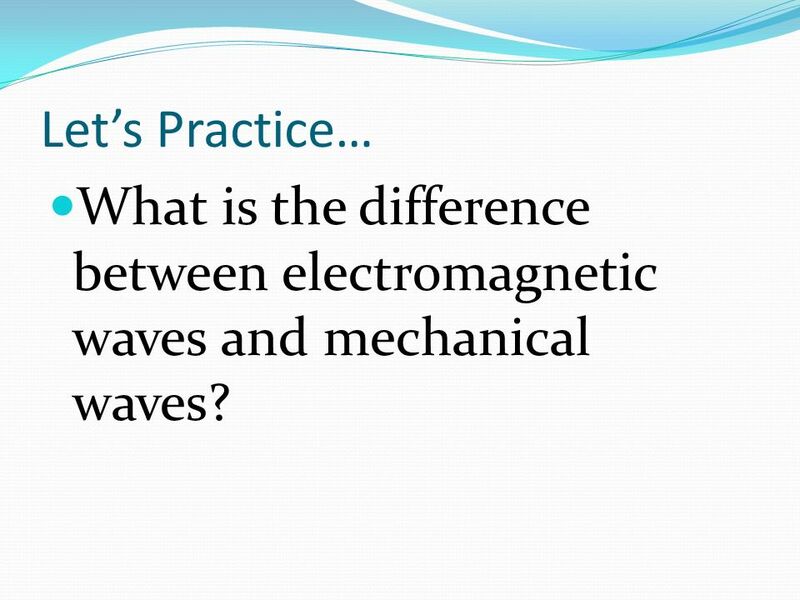 7 Let’s Practice… What is the difference between electromagnetic waves and mechanical waves? 9 GP1 A swimmer is resting on a swimming raft in a lake. Suddenly a motorboat zooms by. A few seconds later the swimmer is moving wildly up and down as the boat’s waves hit the raft. 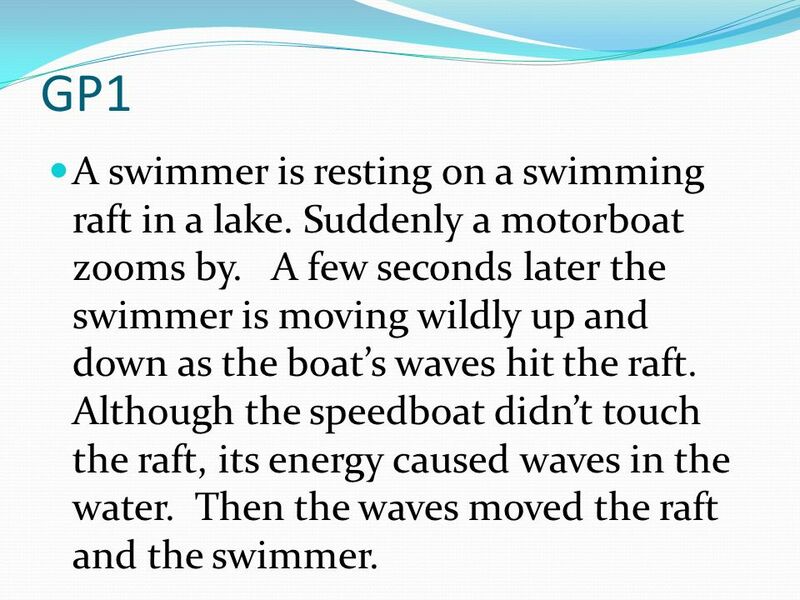 Although the speedboat didn’t touch the raft, its energy caused waves in the water. Then the waves moved the raft and the swimmer. 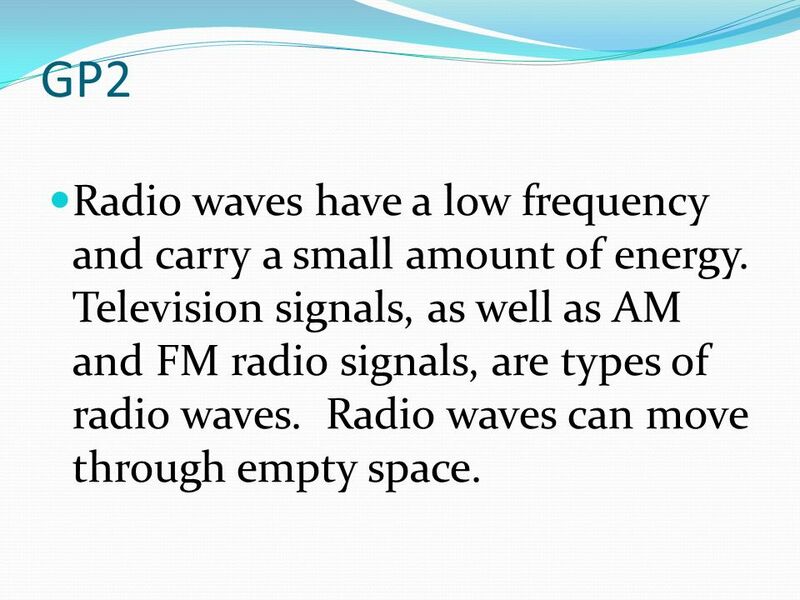 10 GP2 Radio waves have a low frequency and carry a small amount of energy. Television signals, as well as AM and FM radio signals, are types of radio waves. Radio waves can move through empty space. 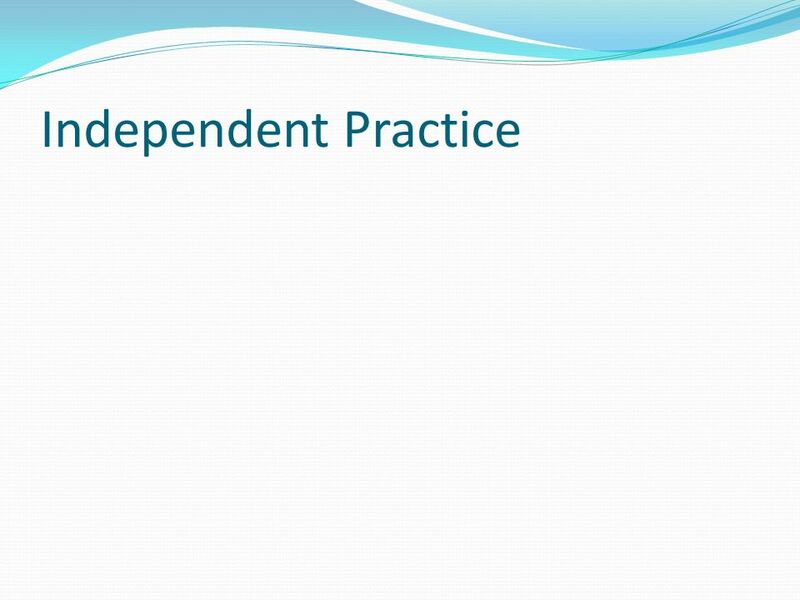 11 GP3 Gamma rays can also travel without a medium. 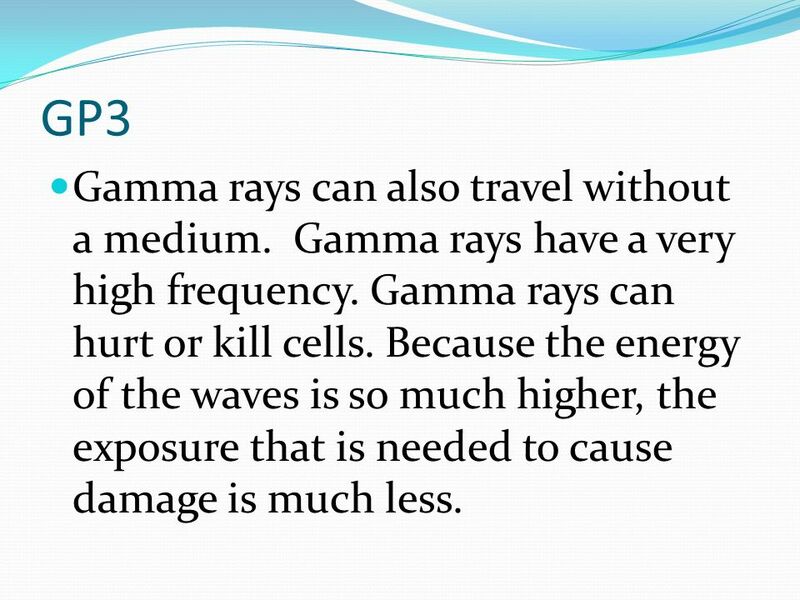 Gamma rays have a very high frequency. Gamma rays can hurt or kill cells. Because the energy of the waves is so much higher, the exposure that is needed to cause damage is much less. 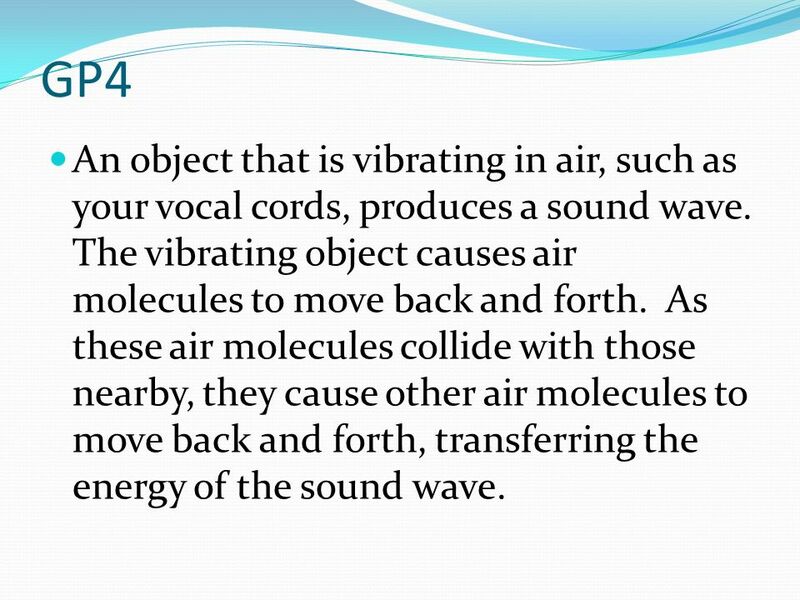 12 GP4 An object that is vibrating in air, such as your vocal cords, produces a sound wave. The vibrating object causes air molecules to move back and forth. As these air molecules collide with those nearby, they cause other air molecules to move back and forth, transferring the energy of the sound wave. 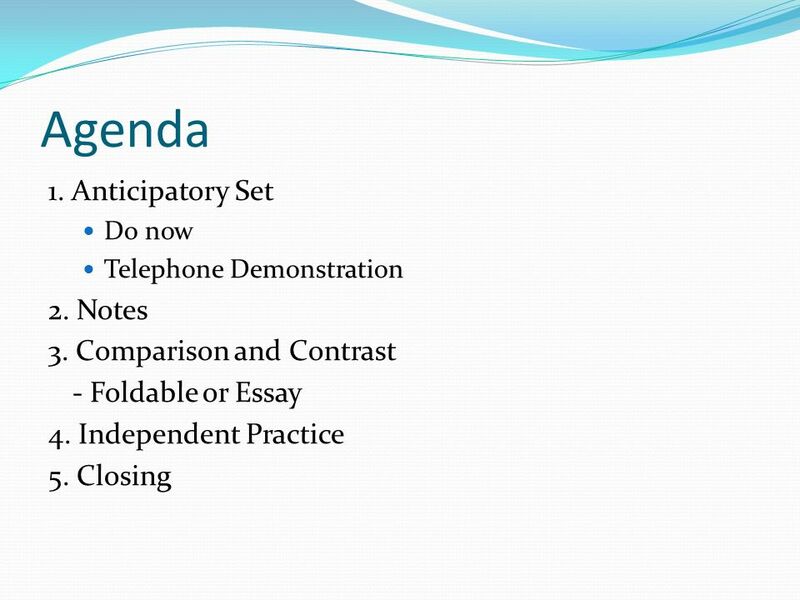 13 GP5 Microwaves are used to transmit some phone calls, especially from cellular and portable phones. Microwave ovens use microwaves to heat food. The radiant energy streaming through a microwave oven causes water molecules in your food to vibrate faster, which heats the food. 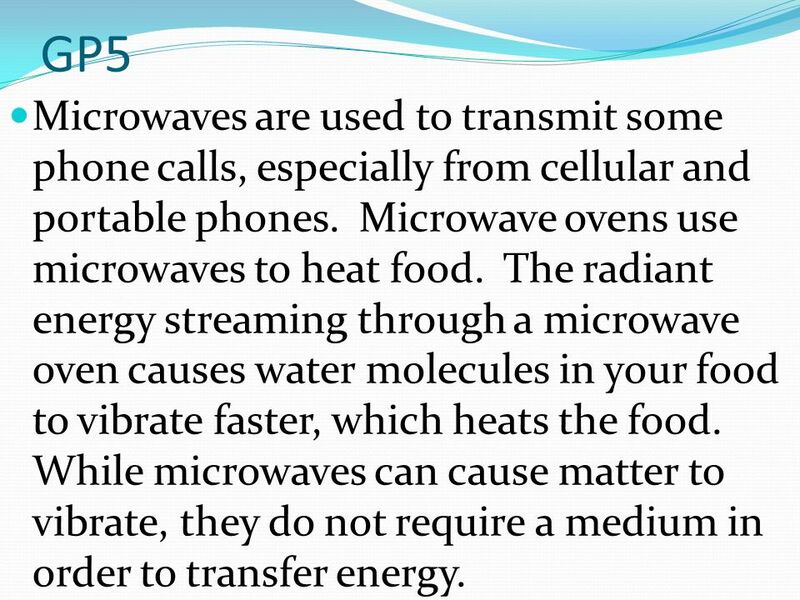 While microwaves can cause matter to vibrate, they do not require a medium in order to transfer energy. 14 GP6 Infrared waves have wavelengths between one thousandth and 0.7 millions of a meter, and they can travel through empty space. Infrared detectors detect objects that are warmer or colder than their environment. They can be used to map wildfires obscured by smoke or to survey underground volcanic activity. Infrared waves are also used to carry signals in some electronics devices. 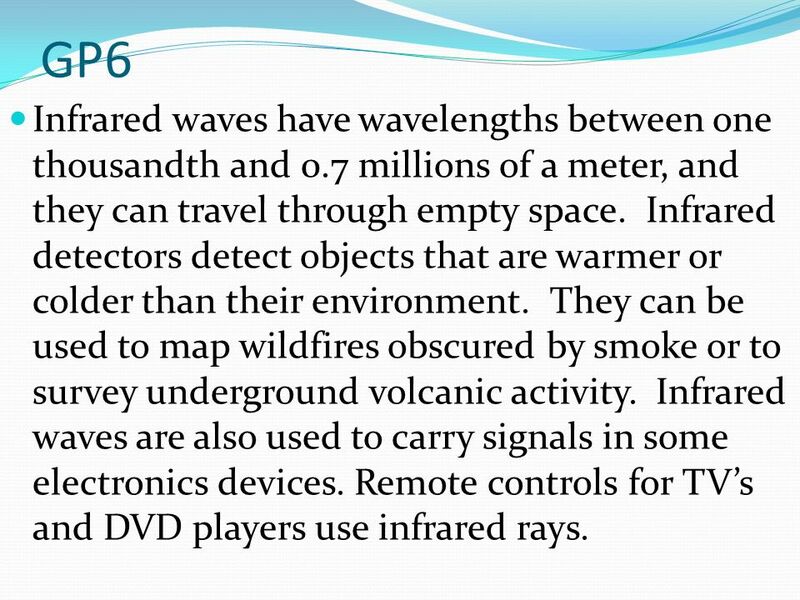 Remote controls for TV’s and DVD players use infrared rays. 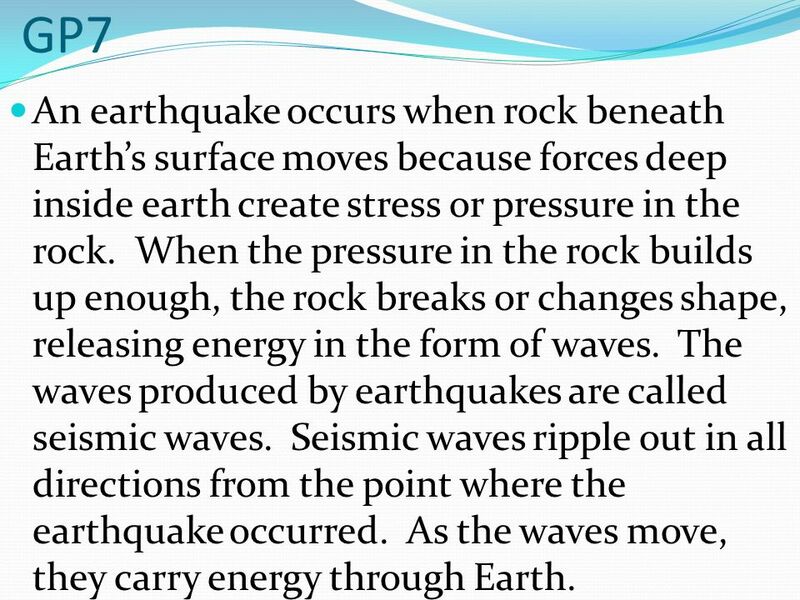 15 GP7 An earthquake occurs when rock beneath Earth’s surface moves because forces deep inside earth create stress or pressure in the rock. When the pressure in the rock builds up enough, the rock breaks or changes shape, releasing energy in the form of waves. The waves produced by earthquakes are called seismic waves. Seismic waves ripple out in all directions from the point where the earthquake occurred. As the waves move, they carry energy through Earth. 16 GP8 Visible light has wavelengths between about 0.7 and 0.4 millionths of a meter. Most objects that you see do not give off visible light. 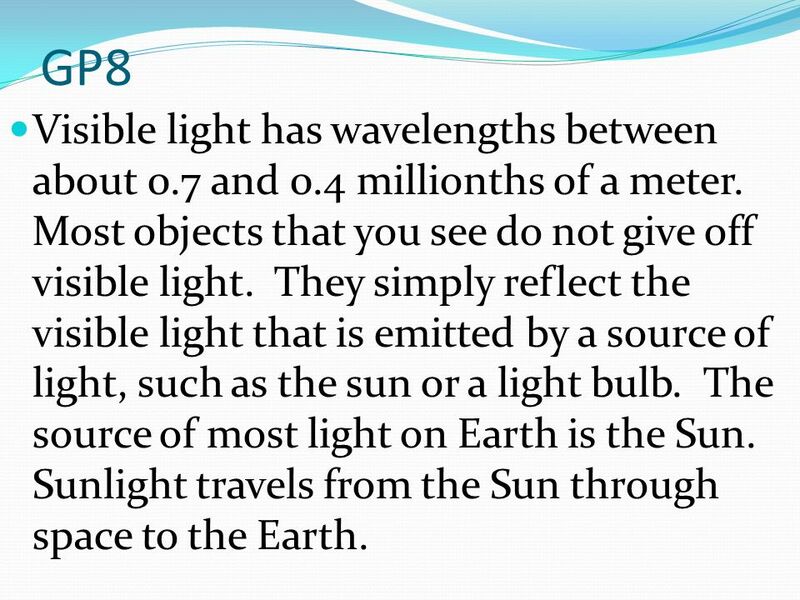 They simply reflect the visible light that is emitted by a source of light, such as the sun or a light bulb. The source of most light on Earth is the Sun. Sunlight travels from the Sun through space to the Earth. 17 GP9 Ultraviolet radiation is higher in frequency than visible light and has even shorter wavelengths. 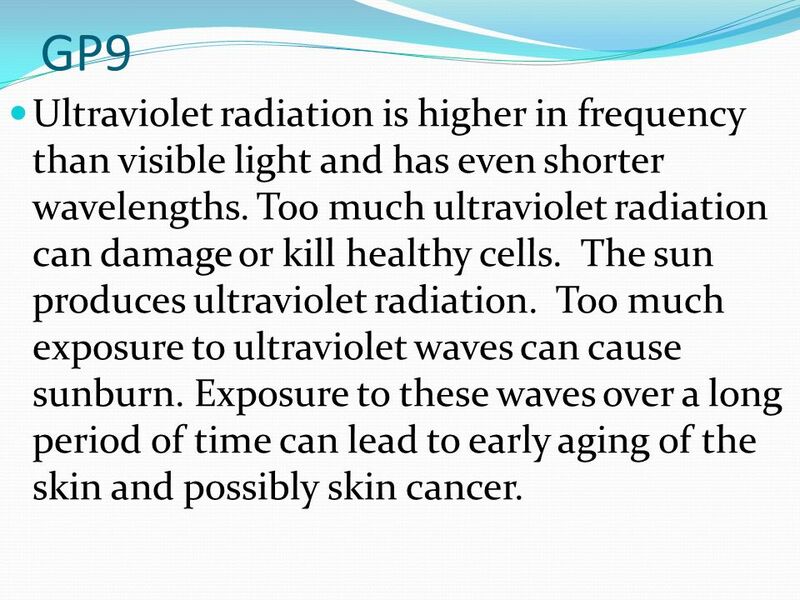 Too much ultraviolet radiation can damage or kill healthy cells. The sun produces ultraviolet radiation. Too much exposure to ultraviolet waves can cause sunburn. Exposure to these waves over a long period of time can lead to early aging of the skin and possibly skin cancer. 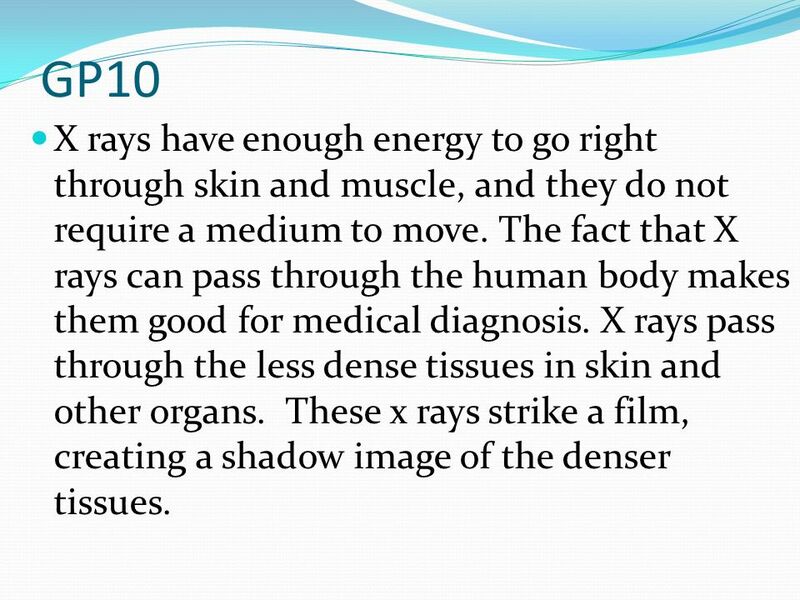 18 GP10 X rays have enough energy to go right through skin and muscle, and they do not require a medium to move. The fact that X rays can pass through the human body makes them good for medical diagnosis. X rays pass through the less dense tissues in skin and other organs. These x rays strike a film, creating a shadow image of the denser tissues. 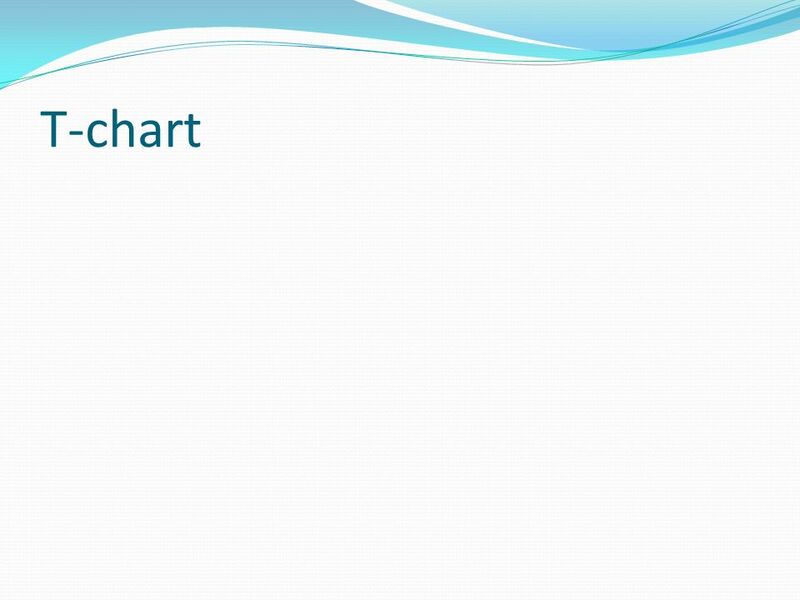 Download ppt "Do Now Which wave has the shortest wavelength? 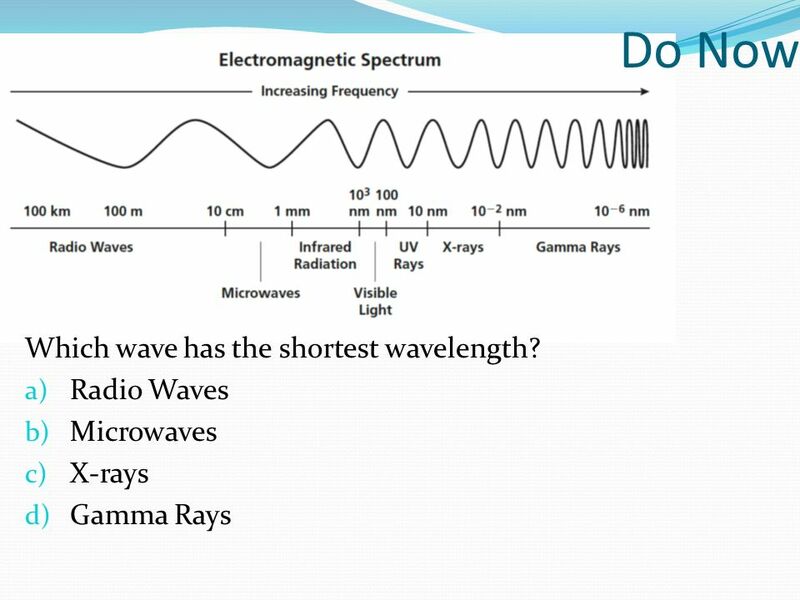 Radio Waves Microwaves"
Waves 1 What are waves? 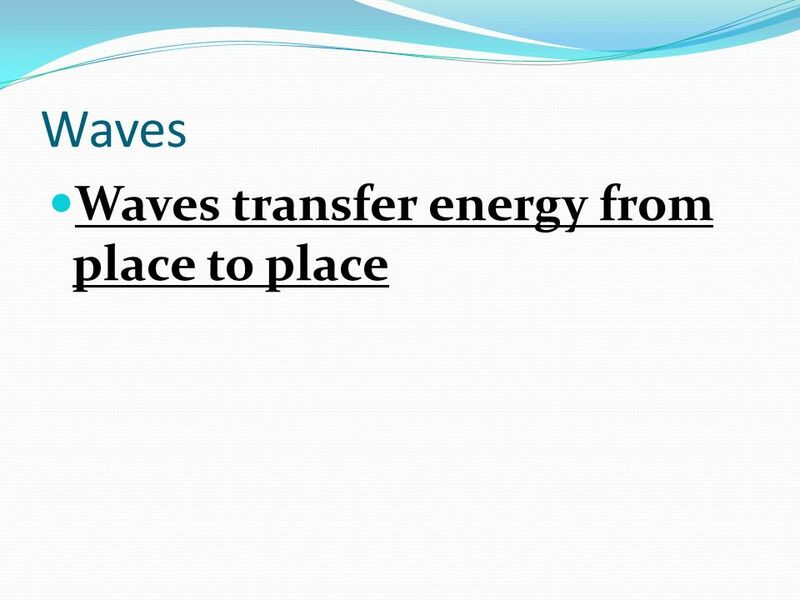 Different types of waves carry signals to televisions and radios. Sound and light waves move all around you and enable you to hear. Waves: Light, Earthquakes, Analog vs. Digital # 20. What is light? An electromagnetic wave that can be seen by the human eye. Can travel either in matter or empty space.